December has been another big month for the environment with the United Nations Conference on Climate Change (also referred to as the Paris Climate Talks and COP21) ending in a broad, world-wide agreement to reduce greenhouse gasses in an attempt to combat global warming. 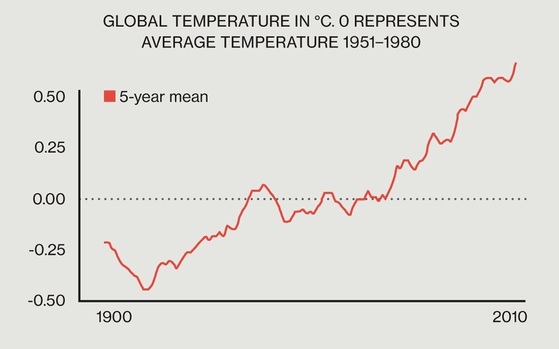 The agreement confirmed the target of keeping the rise in temperature from the pre-industrial world to below 2°C, which scientists believe is necessary to prevent a global catastrophe. The agreement even establishes for the first time, that the world should be aiming for a rise of only 1.5°C to protect island states, which are the most threatened by the rise in sea levels. The Paris agreement requires all countries to review their contributions every five years from 2020; they will not be able to lower their targets and are encouraged to raise them. 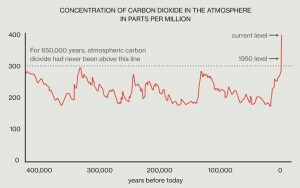 In addition, countries will aim to achieve carbon neutrality in the second half of the century. See CPO21 for more information. President Obama strongly praised the agreement and recognized his administration’s success and world leadership that helped achieve the agreement. Reaction was partisan, as expected, with support from Democrats and criticism from top Republicans who vowed to block the US signing of the treaty. Somewhat shadowed by this major worldwide treaty were several key US and state government actions that illustrate the opportunities and challenges of meeting this goal at home. On the pro-climate side, the US Congress voted to extend the solar Investment Tax Credit (ITC) and wind Production Tax Credit (PTC) for another 5 years, which should help maintain investment in new solar and wind power and help continue to drive down costs. And in California, regulators rejected requests by utilities to increase fees and cut payments to new solar users in a proposed ruling that will help continue the rapid growth in rooftop solar systems in a state that is seen as a leader in the drive to renewable energy. On the flip side, regulators in Nevada decided to cut the payments to homeowners via net metering by 75 percent, from the retail power price to the wholesale level. Utilities can also charge rooftop solar owners a fee for allowing them to sell power to the grid. This is likely to stifle growth in home solar systems for the near term in the second largest rooftop solar market in the US. Once again, politicians are showing that the path to a renewable future is going to be a complex one with both successes and challenges. But, as the goal of OWOE is to help educate the public on the science behind energy issues, we would like to leave readers with two very sobering plots that were just published by MIT Technology Review in their January/February 2016 edition. 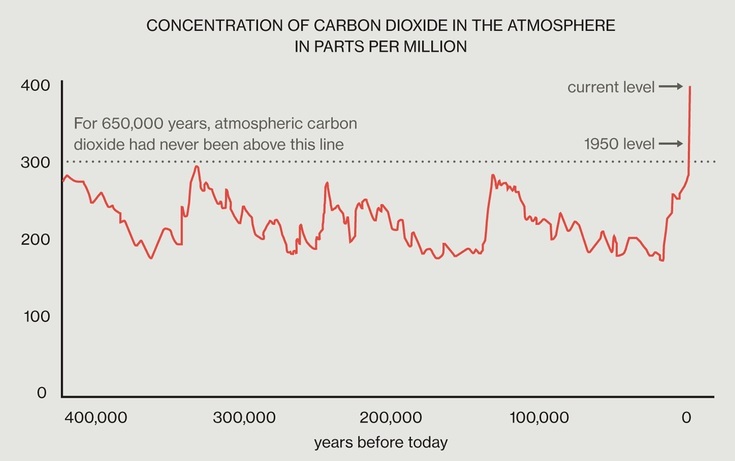 The first is the historical concentration of carbon dioxide in the atmosphere over the past 400,000 years.The insert note says it all – the current level of CO2 in the atmosphere is approximately 30% higher than the highest level it has ever been in the last 650,000 years. 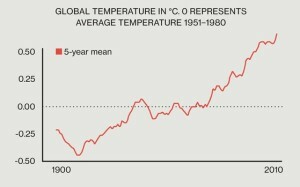 The second shows the steady rise in global temperature over the last 100 years. Be sure to see more from MIT, one of our top universities that is also helping to lead the way to a renewable energy future, on the OWOE Amazing Energy page. Previous PostReflection on DOE Solar Decathlon and Cal Poly INhouseNext PostWhat about transportation?